Name: Macari - Modern Bathroom Vanity Set 63"
The Macari with a white natural marble countertop is a modern Bathroom Vanity set that embraces the latest trend in luxury modern bathroom design. This modern double bathroom vanity boasts sleek lines that create an eye catching element to any home. This beautiful double modern bathroom vanity is ideal for any size bathroom. A spacious white natural marble countertop allows for a comfortable experience every time with this modern bathroom vanity. The main cabinet, featuring 2 cabinet compartments and 2 center drawers, allows for plenty of flexible storage. 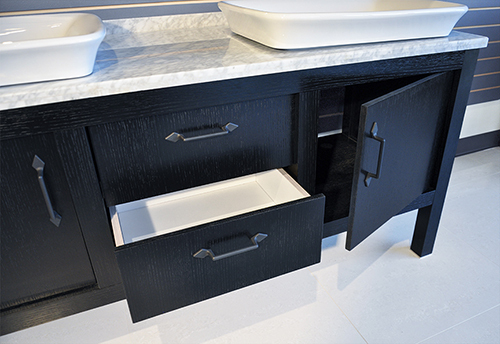 At the pinnacle of this modern bathroom vanity cabinet sits a fashionable, contemporary sink. Modern chrome faucets can be added to this modern bathroom vanity set to complete the design. 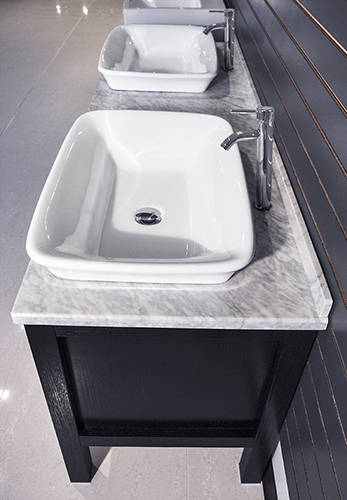 Look no further for you Modern Bathroom Vanity, Macari has it all! Every element included in this modern double bathroom vanity set was designed to exquisitely offer a state of luxury, while the combination of these parts delivers an atmosphere of rest and relaxation. The Macari is a Modern Bathroom Vanity set which proves once again that beauty, form, and function can co-exist harmoniously.